BestSync is a powerful and reliable software application that gives you the ability to quickly and easily synchronize and backup your files. It comes equipped with an interface that’s relatively easy to navigate and use and comes equipped with a ton of handy features. With BestSync, you can compress and encrypt your files, save a log file and check it out when you have the time, and a whole lot more. This application even gives you the ability to process multiple files at the same time so that you can get the job done quickly and move on with your day. As far as synchronization and backup of your files goes, BestSync is the perfect solution for beginner and advanced users alike. - Lets you choose which files you’d like to synchronize ad back up right from the get go. - Creates a backup file on your computer before synchronization to ensure that you have a copy just in case something goes wrong. - Lets you compress and encrypt the files you’d like to quickly and with very little effort. - A handy task scheduler that can help make the whole process go a little smoother. - Keeps a handy log file with detailed information about the performed operations and possible errors that you can check in on whenever you’d like. 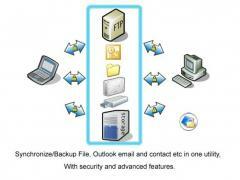 - Gives you the ability to process multiple files at the same time. - Lets you apply filters as you need to. Please note that this trial version of BestSync will only remain valid for 30 days.